The Anti-Distracted Driving Act, or Republic Act 10913, has been -at the very least- problematic for the Department of Transportation. The contentious wording and stipulations led to motorists fearing being apprehended -justly or not- or worse, being extorded on the streets. It also didn't help that the DOTr mixed up their communications for the Implementing Rules and Regulations, culminating in a variety of memes and a TV interview with Assistant Secretary Leah Quiambao saying, much to our chagrin, that you can mount a smartphone with a GPS under the steering wheel. Let me rephrase what I said: RA 10913 wasn't problematic for the DOTr, it was a disaster. It also didn't help that the word distracted, as a fundamental principle, is a state of mind that means preoccupied with something else that doesn't concern the task he/she is performing. How is a government agency supposed to quantify, qualify, and regulate what a driver is thinking? And so it came as no surprise that the implementation was suspended just as quickly as it started. Last week the Department of Transportation sent us a letter asking for us to meet with their Technical Working Group (TWG) to review the IRR of RA 10913 as resource persons, and so we joined them last May 30. When I walked into the conference room, it was comprised of the many agency heads from the DOTr that concerns the implementation such as the MMDA, the LTO, and the LTFRB. Also present were representatives from the Automobile Association Philippines (AAP) headed by Gus Lagman, the Chamber of Automotive Manufacturers of the Philippines, Inc. (CAMPI), the Philippine Global Road Safety Partnership (PGRSP), ImagineLaw, Uber Philippines, Grab Philippines, and the World Health Organization (WHO). Leading the meeting was Atty. Leah Quiambao, the DOTr's Assistant Secretary for Legal Affairs, and Assistant Secretary Edgar Galvante of the Land Transportation Office (LTO), himself a retired PNP three-star general. Needless to say, if you wanted to feel like the least accomplished person in a room, this is the one to be in. Right from the get-go, we found out just how firmly tied the hands of the DOTr were in crafting the IRR; Republic Act 10913 was so specific in its provisions that there really was not much in terms of wiggle room to craft an IRR that is firm but reasonable based on modern motorist realities. The main problem is exposed after a cursory reading of the law: to any experienced motorist who drives to and from the office, to their place of business, to attend classes at school, or other place commonly associated with their daily lives, the RA 10913 gives the impression that it was written by people who actually don't drive, or at least have the luxury of a third party driving for them. Be that as it may, dura lex sed lex: the law is harsh, but it is the law. Given the specific, almost micromanaged nature of RA 10913, the DOTr TWG really had no choice but to stay faithful to the law, almost to the letter. In fact, the RA and the IRR are practically identical, and an IRR cannot go against or even correct potential flaws in the law it is supposed to be based on. Still, the TWG and the resource persons (including two of us in the motoring media) did their best to try and review the IRR, accounting for modern motoring sensibilities like using handsfree devices, working on allowing one swipe on a phone to answer a call (in handsfree or speakerphone mode), the allowed positioning of a device if it's being used as a navigation aid. Here is what the TWG discussed during our review with them. The spirit or essence of RA 10913 really is to prevent cellphone usage as a mobile communication device or for entertainment while driving. It does not matter if the car is actually in motion or whether it is in traffic. Watching movies? No. Playing games? No. Facebook status updates? Absolutely not. Laws are based on certain terminology and their definitions, and in this case the phrase “line of sight” was something we saw as problematic. Former LTO/LTFRB chief Bert Suansing was actually the first to point out that the phrase led to much confusion, especially since line of sight literally meant anything you can physically look at; the road is in your line of sight, the radio is in your line of sight, and the car's floormats are also in your line of sight. It was suggested that the phrase field of view or primary field of view would be better, given that it would be defined by what the driver can see through the windshield, and that it should be unobstructed. Phones can actually be used, provided that they be used in a handsfree manner, meaning either in speaker mode, with an earphone, with a Bluetooth earpiece/headset, or other similar device (built-in to the car or otherwise) that would prevent a person from taking their hands and eyes from the primary controls and the road. It was brought up during the meeting that -even with the presence of handsfree accessories- a driver would still have to press or swipe the phone in order to make or answer a call while on the road. 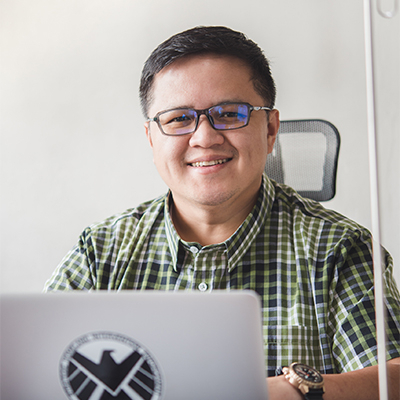 ASEC Quiambao brought up that a one-swipe or one-press motion wouldn't be a problem for motorists, but it cannot be put as an exemption in the IRR because it could potentially be a slippery slope. The law only covers handheld communications and entertainment devices, meaning dashcams are not covered. Even items such as unofficial windshield stickers (not the ones issued by the LTO) are not covered, nor are distracting billboards, bright LED displays, blinking taillight assemblies, jeepney placards, so on and so forth. Just to be sure, I asked whether multimedia head units are covered especially since they can be used to play DVDs or movies via a USB stick; certainly a potential distraction. The TWG quickly responded that the device must be handheld, and by being a built-in unit with the car, DVD-capable multimedia units are not covered. What was also discussed in depth was what can be considered proper placement of a mobile phone when being used as a navigation device. RA 10913 was drafted at a time when apps like Waze and Google Maps were not as widely used -or as essential- as they are today, so there are no provisions to allow for their use, even with proper safety precautions like mounting them using suction cups or other devices so that the driver doesn't have to physically hold the phone. The TWG worked out that a device in navigation mode can be used but mounted on top of the center portion of the dashboard. There are limits though, as the device cannot protrude more than 3 inches taller than the highest point of the middle section of the dashboard, meaning it has to be placed in landscape mode. The driver must also set the destination prior to departing. It was also revealed to us that there was a major grammatical error in the wording of Sec. 5 Extent of Coverage, part C, stating that the law covers even motorists who “are pulled over to the side of the road in compliance with a traffic regulation”. The error lies in the fact that it was intended to be OK for a motorist to pull over to the shoulder of the road -so long as no obstruction is created or other rule violated- to lawfully use his mobile phone. Still, the law passed with the contentious phrasing. We suggested to the DOTr to provide a proper procedure and guideline for lawfully pulling over to the shoulder, stopping and activating the hazard lights to use the phone. Given the language of the law that will be a tricky fix because an IRR cannot rise above the source material, in this case a Republic Act. Another big problem for RA 10913's IRR was the actual implementation of it. There was concern regarding the potential for using RA 10913 as a means by enforcers to randomly apprehend motorists or even extort them for bribes, given the problematic wording. The MMDA representative relayed this concern, as there have to be clear guidelines that will have to be taught to their enforcers so as to be able to implement this properly and legally, hence the 3 inches above the dashboard proposal for mounted phones in navigation mode. And if there is a protest from the motorist, then the enforcer can take a photo for adjudication by a higher authority. Still, there are plenty of other problems, as the law even covers carabao-drawn carriages, bicycles, and even habal-habals... yes, those motorcycles with up to 7 or 8 people riding them using makeshift outriggers. They shoudn't even allowed because they are already technically overloaded. There was also talk of how to address the fact that a driver's license is not required of a bicyclist; how can you fine -and keep track of the number of offenses- if the person doesn't have a license? Do you confiscate the bicycle? All these and more were discussed at the review of the DOTr TWG on the IRR of the Anti-Distracted Driving Act. Yes, RA 9013 is problematic, and so followed the issues with the IRR. The DOTr is now busy reworking the IRR based on the inputs from yesterday's meeting of the TWG and the resource persons. It's a tough job and, from what I gathered, they didn't really relish the idea of implementing it. But at the end of the day, we follow the law, and an executive branch of the government can't exactly re-write a law written by the legistlative branch. The law is the law, and orders are orders. Still, despite our personal opinions of RA 10913, there is a very good basis for it. Statistics do show that driver error is the leading cause of road accidents, and being distracted is arguably -if not definitely- a big contributor to that. We just wish they focused on the implementation of safety matters like driver education, proper adherence to road rules, speed limits, not blocking intersections, riders with no helmets, lane splitting, improper overtaking, overloaded vehicles (especially public transport) and roadworthiness, just as vigorously as they would implement RA 10913. After 22 years, can coding still keep the house in order? Have our streets descended into anarchy?